Loau Tuiloma Dr. Luafata Simanu-Klutz, an Assistant Professor in the University of Hawaiʻi at Mānoa’s Indo-Pacific Languages and Literatures department, will give the second talk in the inaugural Sāmoana Lecture Series. 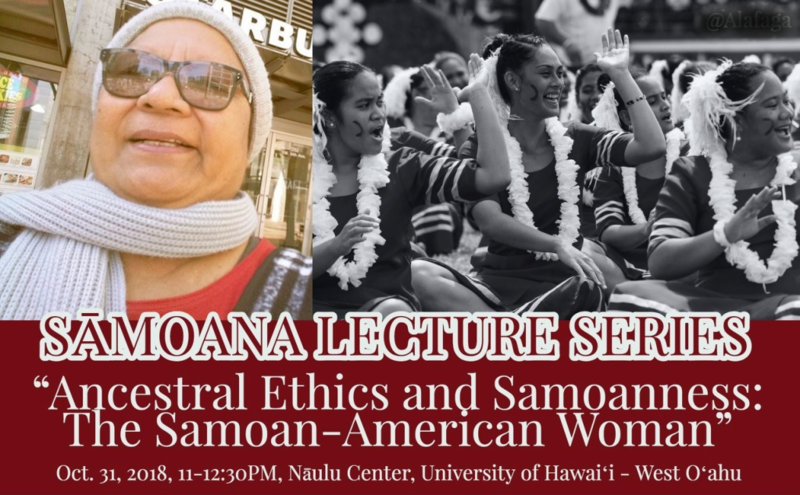 She will give a talk titled “Ancestral Ethics and Samoanness: The Samoan-American Woman” as part of the lecture series, which is organized by UH West Oʻahu’s Hawaiian-Pacific Studies program. The lecture is scheduled for 11 a.m.-12:30 p.m., Oct. 31, in the Nāulu Center. Dr. Simanu-Klutz’s talk will define the Samoan-American woman and explain how ancestral work ethics are evident in the execution of roles and responsibilities in both contemporary Samoan and American contexts. The juxtaposition of the stories about the originals in antiquity on the one hand, and those of their descendants on the other, sheds light on a Samoanness that often baffles the non-Samoan observe. Simanu-Klutz’ presentation will argue that it is in this sense of Samoanness that structures how Samoan women sustain a resilience as daughters and sisters working to balance the demands of kinship and professional obligations in their daily lives in the United States. The new lecture series focusing on Samoan language, culture, history and contemporary issues debuted on Oct. 18 and has a theme of “e au le inaʻilau a tamaʻitaʻi” (literally: the women’s row of thatch reached the top of the house first; metaphorically: women can achieve anything they set their mind to). This traditional Samoan proverb extols the ability of women to succeed and excel in any endeavor they take, even superseding men in areas in which they normally dominate. Simanu-Klutz she teaches second and third year Samoan language, literature, and history, and upper level courses on traditional Samoan literature, Samoan women writers, the works of Albert Wendt and other modern Pacific island writers. She also an affiliate faculty for the Center for Pacific Islands Studies. Tagged Hawaiian-Pacific Studies, Humanities, Sāmoana Lecture Series, The University of Hawaiʻi-West Oʻahu, www. Bookmark the permalink.